Did you know that you can easily do highlights and lowlights at the same time without using bleach? Yes, its possible with Scruples Illusionist Cream One-Step Highlighting System and Scruples Hypnotic Cream Lowlighting System. 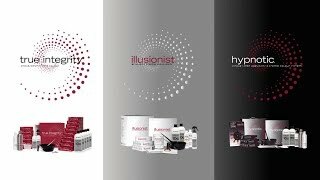 Watch the following video and learn how to use Scruples ILLUSIONIST Brilliant Creme Highlights and HYPNOTIC Single-Step Creme Lowlights with Amie Breckenridge Goltz, Scruples Director of Education. Both of these products contain PBX (Protective Barrier Complex) which is an innovative, patented formula that replenishes moisture and protein. It also improves hair elasticity and inner strength. 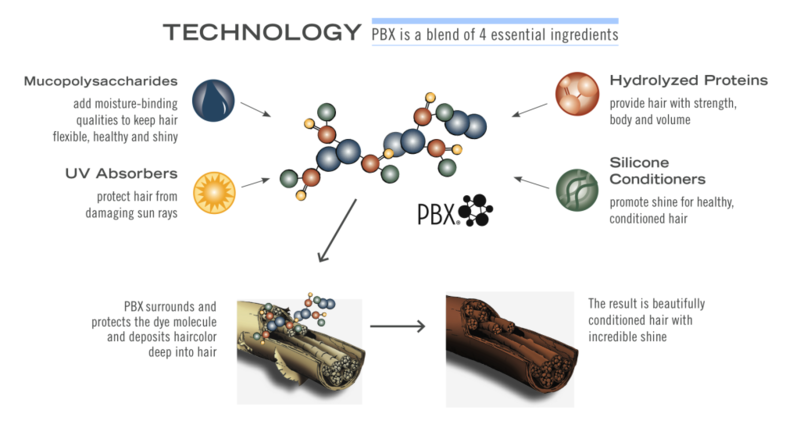 PBX works to surround and protect the di-molecule, while depositing hair color deep into hair. The result is beautifully conditioned hair with incredible shine! These coloring systems contain the nutrient-rich botanical blends of Acai’ Berry, Acacia Flower Extract, Avocado Oil, and Aloe Vera to enhance the condition, shine, and brilliance of the hair. 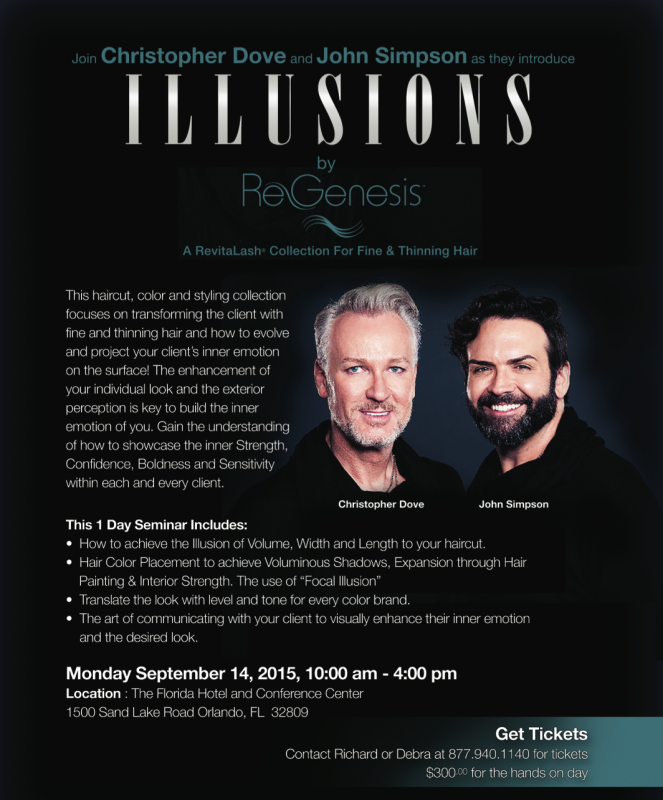 Illusionist Highlights can provide subtle lift of 1 level and beyond 7 levels through natural or color treated hair. There are 8 cream color options that provide high concentrations of pigment for intense reds and luminous blondes. These highlights are very gentle to hair due to the low ammonia content. 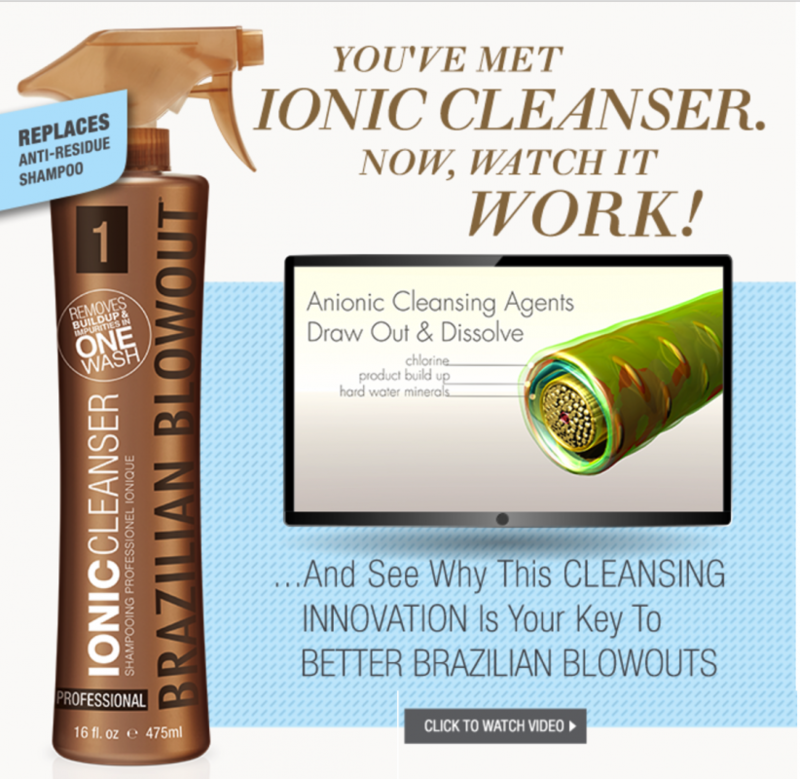 The Illusionist Accelerator Powder provides the colorist controlled lifting without the use of bleach. It is infused with Aloe Vera and Avocado Oil to give the hair moisture and maintain the integrity of the hair. The red shades do not require any Accelerator powder. Be sure to use only Scruples Pure Oxi 10, 20, 30, or 40 Volume Cream Developer. To ensure optimal results, be sure to clarify the hair with Scruples Hair Clearifier Treatment to purify your clients hair before the color service. Next, use the Cream Level Finder to determine the natural level of the hair. Go to the darkest part of the hair to determine the natural level. Choose the desired highlight by using the Illusionist Swatchbook. 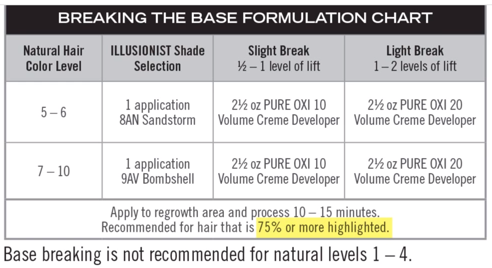 Find the natural or color treated level on the left side of the formulation chart. Go to your desired highlight shade across the top of the chart, then intersect the two and go to the box to find your formulation. You will have two choices, natural or color-treated. Step 1. For blonde shades, measure out level scoops of Accelerator Powder. Step 2. 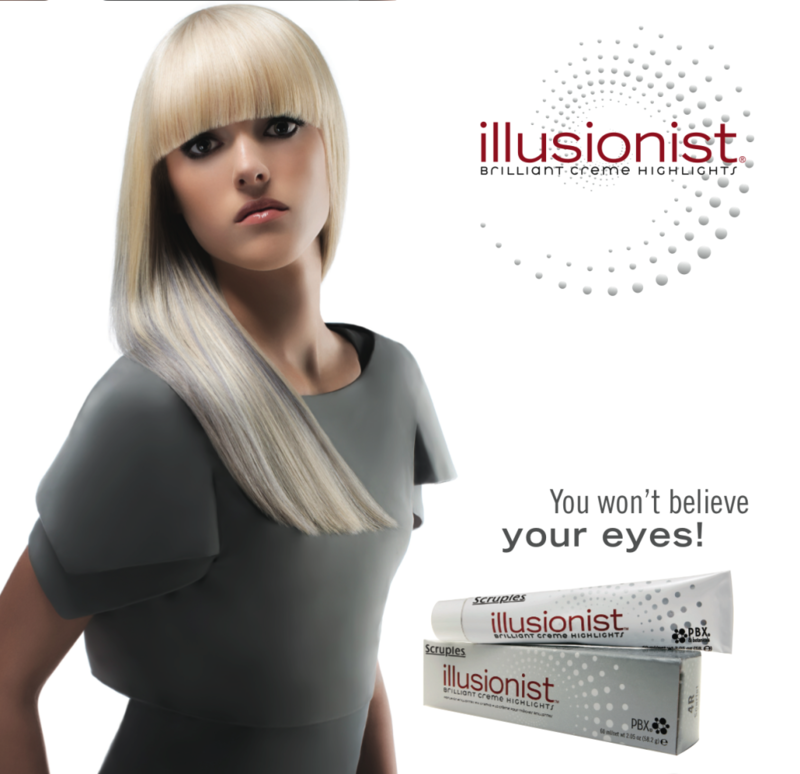 Dispense 1/2 tube (1 application) of Illusionist Hair Color. Step 3. Measure appropriate amount and volume of Pure Oxi Cream Developer. Step 4. Mix thoroughly into a creamy consistency. DO NOT combine highlight shades! On tinted levels 1-3, process with heat for optimal vibrancy. For refreshing the length in red shades, use Pure Oxi Demi-Permanent Creme Developer, mixing in a 1:1 1/2 ratio. Not recommended for on-the-scalp applications! To create a multi-dimensional look, Hypnotic Single-Step Lowlights may be added. Each cream color in the Hypnotic system contains the filler and lowlight shade to achieve expert results in one simple, time-saving formula. Lowlight or tint-back natural or color-treated hair with 10 shades that range from vibrant reds to rich browns to dark blondes. Processes with Pure Oxi 10 Volume Creme or Demi-Permanent Developers. Utilize the Hypnotic Swatch book to determine shade selection. Make sure it compliments the Illusionist shades already chosen. Step 1. Dispense a 1/2 tube or 1 application of Hypnotic Creme Color. Step 2. 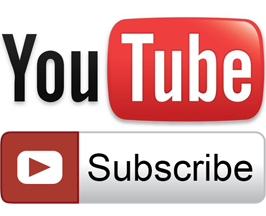 Add either 10 or demi developer. This mixes at a 1:1 1/2 ratio. Step 3. Mix together to a creamy consistency. For Gray Coverage, use 10 volume developer at a 1:1 1/2 ratio. DO NOT combine lowlight shades! The filler needed at each level is specifically formulated to achieve desired shade selected. Take nice thin slices – if you can’t see through it, don’t do it! Apply product evenly from scalp to ends, ensuring proper saturation. When applying the Hypnotic lowlight shade, be sure to turn the brush to an angle so that it appears seamless on the hair. Process under a pre-heated dryer at medium heat for 15-30 minutes. When processing with heat, make sure to do a 5-minute cool-down. If you choose to process at room temperature, process for 45 minutes from the time the last foil is applied. After processing, rinse hair thoroughly removing residual color from the hair. Shampoo with Scruples preferred shampoo. Use Scruples NO H2O2 No Peroxide to remove remaining peroxide residue from hair. Spray and let set for 3-5 minutes. Rinse NO H2O2 from hair. Apply and rinse preferred Scruples conditioner. 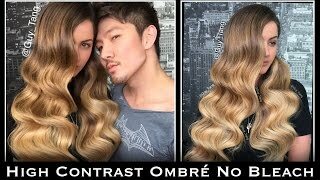 You should now have a vibrant, finished look! So what did you think? Please leave your comments below! If your are a cosmetologist in the Jacksonville area and want to find out more about Scruples products, then please go to my other website at: UniqueSalonProducts.com.